We're in the midst of the after effects of an ice storm right now....no fun at all!!!!!!! I hope you all are keeping safe and completely warm!! These clear pails are for my younger one's teachers. I filled them with different types of chocolate and a mini candle in a jar. It also fits with yesterday's challenge on SCS to make a last minute gift....I do believe I achieved that part with no problem! I didn't want to make these too Christmassy so instead of using my X-mas rub-ons, I used my retired Love & Happiness ones and Holiday Treasures dsp. The paper is beautiful and I think it's pretty versatile as it lends itself to more than one Holiday--gotta love that! I also made a couple of snow globe ornaments to hang off the handle instead of ribbon. I think this is just more appealing in this case than a bunch of ribbon. Thanks for stopping by and take care!!! These are great gifts, Jackie. I too have used lots of rub-ons this year. I'm sure the teachers will love your gifts! I just love those. I love rub-ons they are so quick and easy and look fabulous. I just have to keep them away from my 5 year old because she loves them more than I do. these are beautiful Jackie!! Stay warm and safe! These are lovely and how thoughtful of you to make them to be more than just for Christmas! Hope you are staying safe and warm! We are experiencing severe weather here too with more predicted this weekend. Your project is SO lovely, the ornaments fron the Big Shot are so cool with this. Beautiful paper and design on this project!! Love it. Beautiful gifts! I would love to receive one. They came out so cute. I am sure the teacher will be happy with your gift. I know I would! this a re adorable Jackie! We have had bad weather here too, Ice, snow freezing rain, school was out for three days. Better today, but more predicted for Sunday! These are super! I know they will love them! These are sooo wonderful, Jackie...what a great idea for a teacher gift!!! I never think to use these...thanks for the inspiration!!! Speaking as a teacher, this would be great to receive, and the pail could be used again after the chocolate (another great teacher gift!) was quickly eaten. Great idea and I like that they are Christmasy. That way the teachers can use them year round. These are gorgeous! The teachers will love them! 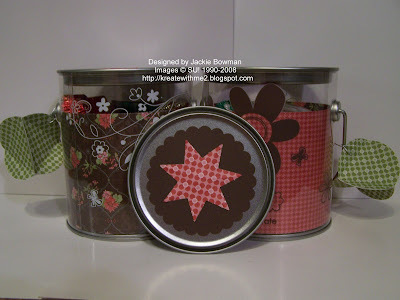 great gifts :) I always love ideas for easy to make presents. where did you get the pails? Really cute gift idea! I am sure the teachers loved them!